1. Preheat a griddle pan to hot. Flatten the chicken breasts in between 2 sheets of clingflim with a rolling pin. Season with sea salt and rub with oil. 2. Place the fillets on the griddle to cook for 3 minutes on each side, or until cooked through thoroughly with no pink meat. Remove from the heat and set aside to rest. 3. Using a sharp knife thinly slice the fennel, removing the tough core. Shave the asparagus with a potato peeler and toss gently in a large bowl with the fennel. 4. Squeeze over the lemon, toss in the lemon zest and mint, and shave over the pecorino. 5. 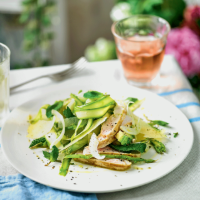 Pile onto plates with the avocado and top with the chicken, sliced. Serve immediately.